An event took place marking World Water Day in Naypyidaw, the capital of Myanmar. I was invited by the government of Myanmar to make a speech. Though on a tight schedule, I decided to go there at any cost. I wondered what I should say to the variety of people who would be present, from government officials, to scholars, to corporate executives, to representatives of NGOs. As I had no time to worry about this, I decided to make a speech entitled A Short Water History of Japan. In my thirties, I belonged to the international affairs section of my ministry. I was responsible for the contents of lectures and scheduling for trainees from Asian countries. I sent the trainees out into the field for on-the-job training at least once during their training sessions, as they were studying river management and disaster prevention. I often accompanied them to local sites for their training. When they left Tokyo, the trainees seemed to relax little by little. The training sessions in Tokyo were putting considerable pressure on these students from developing countries. I once heard about an incident that had occurred at a session on water supply and sewerage systems organized by JICA. After a lecture, the trainees visited sewerage facilities in Tokyo. During the tour, a woman trainee from Indonesia burst into tears, saying that they would never be able to build such splendid facilities in her country. When I first heard about this, I was not sure what I should teach them. But gradually, I realized what I should do. It wasn’t Japan’s state-of-the-art technology that they needed. What was really relevant was the history of Japan and its process of development. When I realized this, I could decide what to say in my speech. Most Asian countries have traditionally depended on rice cultivation. Japan also developed as a rice-cultivating country. Rice has a high calorific value and can be stored for years. It is light and easy to transport. It can be exchanged for other things. Therefore, rice was widely distributed as money in ancient times. 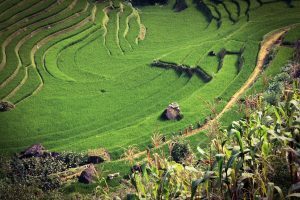 It was natural that rice cultivation prevailed in South-east Asia, located in the subtropical to temperate zones where there is a lot of rain. Rice was originally cultivated in terraced paddy fields (Tanada in Japanese) in the foothills of mountains. People cultivated rice using rainwater that flowed down the hills. This system was introduced by South-east Asia to Japan. Paddy fields were constructed gradually from the top of hills downward. Ueda (rice paddies on a hilltop), Nakada (rice paddies on a hillside), and Shimoda (rice paddies at the bottom of a hill) were laid out. A whole area under cultivation was called Okada (a hill covered with rice paddies). Nowadays, these names are used as family names in Japan. Photo 1 shows terraced rice paddies in Vietnam. However, Tanada (terraced rice paddies) have such a small farming area that it is difficult to increase arable land. In order to sustain itself, a society needs to increase its wealth. To do this in the past, we had to expand our paddy fields, so people headed for more spacious wetlands on alluvial plains. Alluvial plains were spacious and fertile. They were covered with organic soil which had been carried by rivers from forested lands in the upstream for thousands or tens of thousands of years. But the alluvial plains were potentially dangerous places. Rivers flew freely and in times of heavy rain, there was flooding. In order to cultivate rice on these alluvial plains, it was necessary for people to band together. They had to work in unison to change the course of rivers and construct channels in order to utilize river water. People gathering on alluvial plains started to grow rice and formed communities. 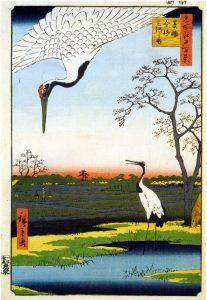 Figure 1 is a print created by Hiroshige 150 years ago, depicting the center of Tokyo. Red-crowned cranes are present. This means the area was a wetland, abounding in food for cranes, such as loaches, frogs, and eels. In the modern period, the flat and spacious alluvial plains were turned into residential and industrial areas. Wetlands were covered with concrete and disappeared. However, the fact that this area was a flood-prone low alluvial plain is still relevant. Photo 2 shows today’s Tokyo seen from the same spot as that of the Hiroshige painting. The modern cities of Japan did not exist in the old days. They were gradually built up through the conversion of wetlands. 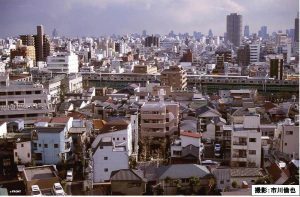 The challenge for flood control in Japan is that by increasing the efficiency of land use, we have increased the potential risks. Now we must recognize this fact. By knowing local history, we can secure the safety of residents. Understanding local history can also provide good information for judging the potential risks to those who will in future experience the process of urbanization. It is a necessary process for both the Japanese and those in developing countries to learn local history, in order to ensure the security of residents and for safer societies in the future. The JWF will issue its first publication, JWF Water Journal. JWF Water Journal is linked with the JWF’s annual event, World Water Day in Tokyo, for Future-proofing our Society. This journal is aimed at considering the long-term and wide-ranging scope of vision that will help form guidelines for action on water issues in the future. It is also meant to contribute to the promotion of various programs and innovations.